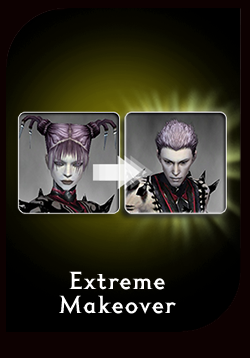 One Extreme Makeover Credit, which can be used in-game to change the hair style, hair color, face, skin color, body scale, and gender of a character. This service allows you to change the gender and appearance (hair style, hair color, face, skin color, and body scale) of a single character. How to redeem - Once purchased, please go in-game and speak with Anatomical Engineer Llye [Stylist] in the Great Temple of Balthazar, located on the Battle Isles. Select the desired gender and alter the aesthetic features to suit your new look. Aesthetic features include hair style, hair color, face, skin color, and body scale.